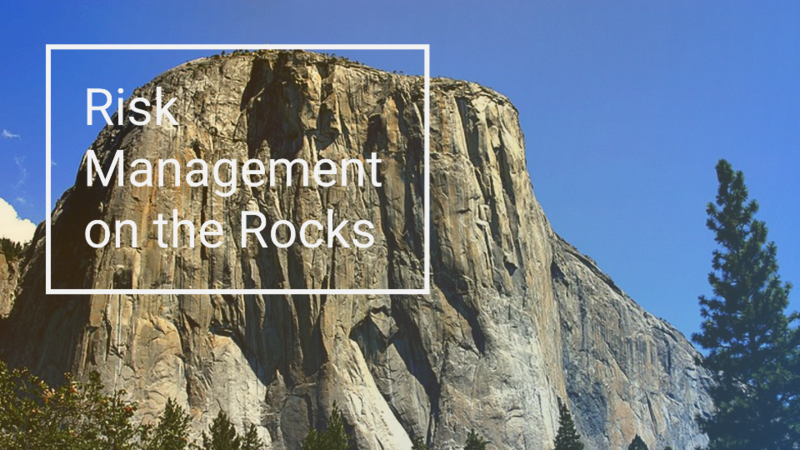 Advisory Board member and risk management professional, Gail Evans, has made a hobby out of rock climbing for more than 20 years. She reviews a recent NYT Op-Doc about Alex Honnold, the world's preeminent free solo climber and his attempt to climb Yosemite's El Capitan. I’ve made a hobby of rock climbing for more than 20 years, so I was naturally attracted to the recent New York Times Op-Doc, “What if He Falls?” As risk management professional, I was immediately struck by the lessons the viewer can learn about risk management. The documentary is a mini-guide for achieving the most challenging of objectives while being smart about managing uncertainty. In their written introduction to the video, directors Elizabeth Chai Vasarhelyi and Jimmy Chin aren’t shy about spelling out the quandary they face: “What happens if the person you are making a documentary film about is attempting one of the most dangerous feats imaginable?” They’ve proposed to film their friend and fellow climber, Alex Honnold, doing what he does best. Honnold, at 33 years old, is the world’s preeminent free solo climber. That means he attempts to ascend dangerous, vertical routes without the help of ropes, a partner or protective gear. He accepts their proposal and decides, if he’s going to do it, he wants to do it big. He’s going to attempt to be the first person to free solo Yosemite’s El Capitan. With an elevation gain of nearly 3,000 feet (915 meters) from base to peak, climbing El Capitan is a dream destination for elite climbers. The team went into this project knowing that Honnold could die in the attempt. If you follow sporting or national park news at all, you’ll know that there have been a number of deaths recently at Yosemite National Park. So, before reading further—or if you didn’t see the resulting movie, Free Solo—I encourage you to watch the video one time through just to get beyond the edge-of-your-seat sensation. Think of it as a TED talk in terms of time investment. Watching it will only take 10 minutes, but with more action and fewer words. The ethical struggle that Vasarhelyi and Chin face is whether filming Honnold’s feat actually creates more risk for Honnold. By understanding the situation and the risks inherent to it, they were able to put a number of controls in place to reduce the danger that Honnold might fall to his death or that other crew members get hurt. Life and death might not be a risk that you face every day in your organization. But a sound risk management framework will include the same elements the film crew demonstrate throughout their project. Part of minimizing risks includes setting the boundaries within which you’re willing to work. Initially, when Vasarhelyi and Chin understood Honnold’s intention was to climb “El Cap”, they had to take a step back and determine if they really wanted to film him after all. Once they decided to move forward, they set working guidelines. First, that Honnold’s safety was always paramount and, second, that his climbing experience be as pure as possible. To avoid the risk of distracting Honnold during his climbs or creating external pressure, the crew agreed to not interact with him when not filming. And, despite two years of training for the big day, director Chin would not cross the line of asking Honnold when he thought he’d be ready. Respecting these guardrails kept the team from interfering with Honnold’s mindset. Capability: The skill sets of any team are key to success. In this case, to mitigate risk, each crew member had to be both an elite climber and expert film cinematographer. Without the right capabilities, they wouldn’t have been able to understand Honnold’s tactics and execute properly on their plan. Preparedness: The right level of practice and training also mitigates risks. At one point Honnold asks, “Why are we out here again? We’re out here because practice makes perfect.” The team spent two years at different locations practicing their filming techniques and choreography, while Honnold readied himself physically and mentally for “El Cap”. Things will always happen that are out of your control. You need to be prepared to respond to these incidents. Remember the falling rock during the crew’s practice trip in Morocco? It was unexpected and it spooked the team. They responded by performing a safety check. Concluding it was safe, they continued filming. What’s the worst thing that could happen? Cameraman Cheyne Lempe admits that he keeps running scenarios through his head of a fall. “What would it sound like? What would I say to people afterwards? What the footage would be like?” However grim, one can’t help but think about the potential emotional fallout when there are only two outcomes at play—making it to the top or certain death. Asking “What if…?” proactively helps you prepare to respond to different outcomes as well as help you determine where you want to draw the line on your appetite for risk. Now watch the video a second time to appreciate all of the aspects of risk management that you weren’t focused on the first time you watched it. What links can you make to interactions between business owners and risk professionals? What other elements jump out at you that I haven’t highlighted?